Enhancements that lift away from the natural nail show a sign of service breakdown. 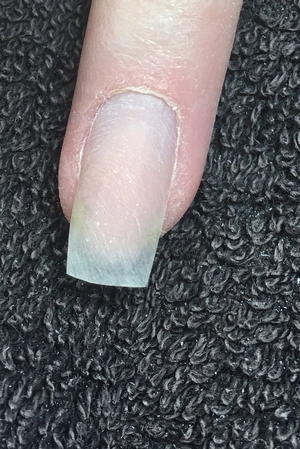 This can occur with any nail coating but is often more common with L&P and gel enhancements. Lifting is typically found at the cuticle area or around the sidewalls and can be recognised as the enhancement appearing to lift off or peel away from the natural nail but it can also occur in any part of the nail enhancement. ‘Pocket lifting’ is often found in the centre of the enhancement when infill and maintenance procedures aren’t performed correctly or damage occurs. There are many things that cause lifting, including improper prep of the nail plate or application, poor natural nail health or client abuse and lack of care. It can be expected to experience a minimal amount of lifting over the weeks due to wear and tear and growth but if your client is experiencing regular or substantial lifting, you need to investigate and address the reason for this. 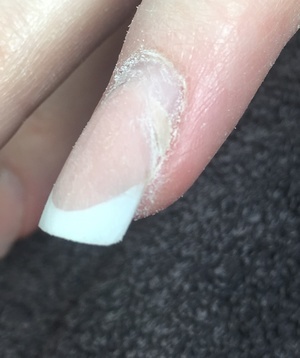 All nail techs can be responsible for bad habits but when these poor practices can directly impact on and damage the natural nail, these habits need to be kerbed. Many techs incorrectly and carelessly remove lifting by using nippers or tools to pull the lifted product away from the nail. This could be due to incorrect education or just poor technique. Not only will this method blunt and damage your tools, therefore leading its own problems such as torn skin and cuticles due to using ineffective tools, it will also damage the client’s natural nail. 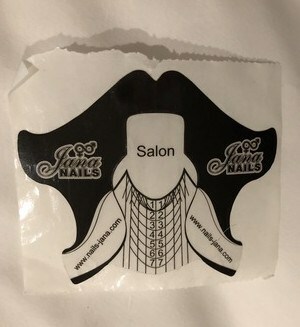 The natural nail will be damaged by this method of removal because although the product appears to not be attached to the nail as it has lifted away, it will still be attached somewhere otherwise it would no longer be on the enhancement. 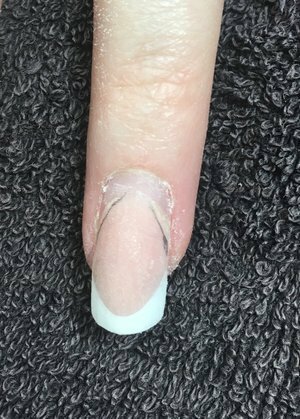 Nipping or pulling at this will cause trauma to the natural nail as well as peeling away layers of the nail plate and causing onycholysis. This will cause the natural nail to be thinner and the health and construction of the natural nail will give an enhancement the correct foundation, so if this is damaged, it will lead to further lifting and you will end up in a vicious circle. Lifting should be removed using correct filing techniques with either a hand file or e-file. The lifting should be removed from where it starts. You can always draw on the enhancement with a pencil as a guide to ensure you are only filing where you need to. Use your file at an upright angle so only the very edge of your file is touching the enhancement. Use firm, slow and controlled strokes of your file at the point where the lifting starts. 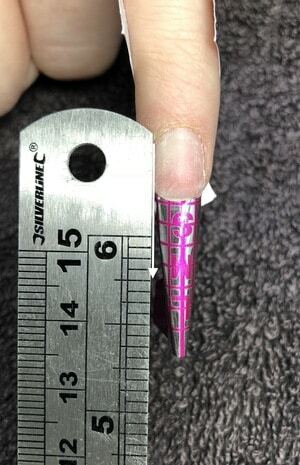 You will start to see a dent in the enhancement, keep filing until this is at the natural nail. Keep removing the dust as you do this and keep checking the natural nail to ensure you aren’t putting too much pressure on the nail or filing too far. Once you have filed to the natural nail, the lifted product will just fall away. When all the lifting has been removed, the enhancement should blend with the natural nail and you should not see any lines or ridges. If you leave any lifting and put more product over the top, you will be at risk of further lifting and potential bacteria, contaminants and water harbouring under the product which you will be trapping further. Take the care and the time removing lifting correctly to ensure the longevity and natural nail health of your client. Form fitting can seem like a minefield and with so many different types on the market, it is hard to know which form you should be using and why. This blog will explain what you should be looking for when purchasing your forms and how using the right form can make a huge difference your application and ease your working technique. While the grid system on many forms can seem daunting, it can in fact make them much easier to use and customise, even for beginners. It acts as a guide for creating the right angles for perfect sidewalls and free edge shapes. You can get different forms for different nail shapes. However, I think it’s good to purchase a universal form that can be tailor made to different shapes. I have just two kinds of forms: one for extreme and one for salon shapes. Many forms that are designed for universal shapes, cannot actually be used for many shapes – mostly square and are only of use for an almond. Different types of formsLook for forms with wide wings, allowing you to join underneath, without tapering the end in and losing your side wall structure. If this tapers, you cannot build a true square structure, even if only creating a very short enhancement. By tapering this shape, without the correct form fit, you are likely to compromise the structure. Seek forms that are perforated for easy separation at the base and always open this to allow correct fit. When choosing a form for extreme shapes, seek double-thick material which does not crease. Disposable – made of foil, paper, plastic or a mix. Reusable nail forms – mostly metal nail forms, sometimes available in plastic. I would always recommend disposable forms because you can tailor them to any nail shape and natural nail, and I find reusable forms a little awkward to disinfect. 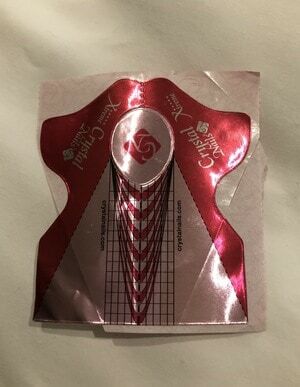 Forms made with both paper and foil tend to be the best because they allow you to create your C-curve without the need to pinch. 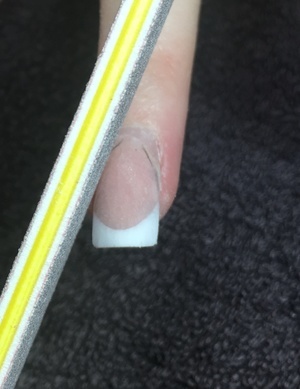 You want to aim for strong adhesion on the forms and check the quality of the glue holding the form together, so they stay in place and do not move or pop open when applied to the finger. Forms made with paper tend to not stay in place and tear more easily and fray when customising. It is important to also look for the quality of the form, the thickness and the paper/foil ratio. 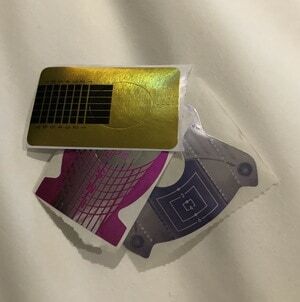 If it feels more paper like, it will still act like a paper form. Forms made with plastic can often disintegrate during application and the colour can stain your enhancement. However, clear plastic forms made with good quality material that is thin and pliable, can be fantastic for hard gel enhancements. Forms with just foil can be great for competition nails and helping achieve a deep C-Curve as they bend into and stay in shape.